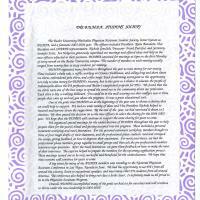 Title page of the BUMPA Scrapbook. 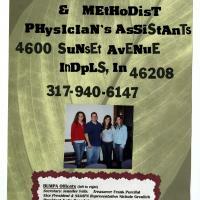 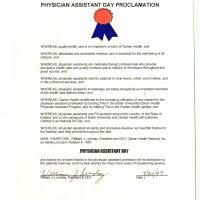 "Butler University & Methodist Physician's Assistants 4600 Sunset Avenue Indpls, IN, 46208 317-940-6147"
A recap of BUMPA Student Society's 2003-2004 year. 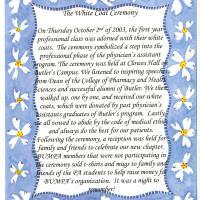 A page detailing the White Coat Ceremony, which took place on Thursday October 2nd, 2003. 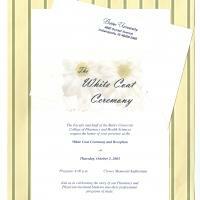 This is a copy of the invitation to the White Coat Ceremony of 2003. 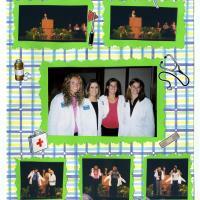 Five small photos, and one large one in the center, with green borders, medical stickers, all on a colorful crosshatch background. 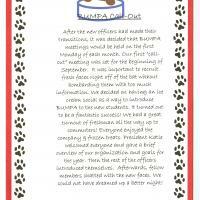 Following Officer transistions, it was decided that the first Monday of every month would be a call out meeting for BUMPA. 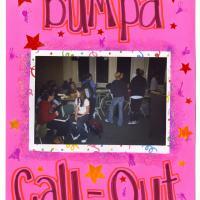 A photo of a BUMPA call out meeting on a pink page, captioned with large marker lettering. 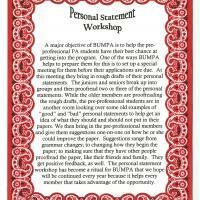 A page detailing how BUMPA held a personal statement workshop for potential applicants in order to polish their application and essay. 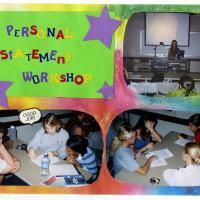 Three photos of the Personal Statement Workshop on a tie-dye background.